Once upon a time, there were nine planets in our solar system—although some people claimed that somewhere, out there, was a mysterious tenth planet that they called “Planet X.” In 2006, the IAU reclassified Pluto, in a hotly contested move that left the solar system with only eight official planets. But this week, researchers published their argument that somewhere, out there, there is another large planet that we haven’t seen yet. Caltech’s Mike Brown and Konstantin Batygin argue that Planet Nine (which is not the same as Pluto, and also not the same as the old Planet X) should have a mass about 10 times that of Earth, and an orbit about 20 times farther from the sun than that of Neptune. Mike Brown is the Richard and Barbara Rosenberg Professor of Planetary Astronomy in the Division of Geological and Planetary Sciences at the California Institute of Technology in Pasadena, California. IRA FLATOW: This is Science Friday. I’m Ira Flatow. Once upon a time, there were nine planets in our solar system, though some people claimed that somewhere out there was a mysterious 10th planet, Planet X. In 2006, Pluto was demoted to dwarf planet status, a hotly-contested move that left the solar system with eight official planets. But this week, researchers published their argument that somewhere out there is another large planet that we haven’t seen yet. A Planet Nine, which is not the same as Pluto, and not the same as the old Planet X. Confused? Well, I promise you this is not an old Ed Wood film. Here to sort out this planet stuff are two scientists making the case for Planet Nine, Konstantin Batygin and Mike Brown, both in the Division of Geological and Planetary Sciences at Caltech in Pasadena. Welcome to Science Friday. MIKE BROWN: Thanks for having us, Ira. KONSTANTIN BATYGIN: Yeah, happy to be here. IRA FLATOW: Tell us what is the evidence that makes you think there’s something out there? KONSTANTIN BATYGIN: Well, what we have found is really a gravitational signature of Planet Nine. And that signature is seen in the most distant orbits of this debris field beyond the orbit of Neptune, that we commonly refer to as the Kuiper belt. If you look at the furthest orbits in this debris field, they all kind of swing out the same way. The only reasonable explanation for this confinement, this grouping of the orbits is that there’s a distant Planet Nine, which is rather massive, keeping them together. MIKE BROWN: Or as I like to say, we have felt a great disturbance in The Force. IRA FLATOW: Oh, I like that. I like that. That’s good. Let me write that down. How confident are you about this? MIKE BROWN: That’s always the hardest question to answer. As a scientist, you try really hard not to believe yourself too much, because that’s often where science goes wrong. And we spent a good year and a half out of the past two years not believing ourselves very much, and actually trying very hard to prove that this idea was wrong, and in fact crazy. Because it always sounds crazy when you say there’s another planet. But after the initial hints, we have been finding more and more signatures exactly where we predicted, and it’s getting to the point where we believe it. We believe it enough that we’re willing to write a paper, and stand up, and say, yes, for the past century, everybody who said there was a Planet X is crazy, and they were all wrong, but we’re right. IRA FLATOW: Is it unusual to first see the evidence of a planet, not know where it is, not actually see it, and then find it? Wasn’t Uranus or some of the other planets found that way? KONSTANTIN BATYGIN: Exactly right. There’s good historical precedent for this. In 1846, Neptune was discovered through a rather similar method. It was first predicted through a mathematical model, a rather complex one, which as its evidence, used the irregularities in the Uranian orbit. So there’s good historical context for this. Now the astronomical search for Planet Nine is on. IRA FLATOW: 1-844-724-8255, 844-724-8255 if you’d like to get in on this. You can also tweet us. A tweet came in already, and asks is it inside or outside of the Kuiper belt, and how far away is the planet? MIKE BROWN: So the Kuiper belt, which of course is where Pluto is, it’s where Eros, these other large objects, where the New Horizons spacecraft just went through. The Kuiper belt is something like 4 to 5 billion miles away from the sun. Planet Nine, at its closest approach to the sun, is 20 billion miles away from the sun, and it’s on a very elliptical orbit. It goes all the way out to 100 billion miles away from the sun. So Planet Nine is well outside of the Kuiper belt, and we only see its effects on the sort of outer fringes of the Kuiper belt, which is why it took us so long to realize it was there. IRA FLATOW: So it kind of orbit would it have? How long would it take to go around the sun once? MIKE BROWN: That orbit is somewhere between 10,000 and 20,000 years to go around the sun, and it and it’s tilted by about 30 degrees compared to all the other planets in the solar system. So a very strange, elongated sort of orbit out there. IRA FLATOW: And how big is the object? IRA FLATOW: And is it a solid, rocky one, or is it a gas one like Jupiter? KONSTANTIN BATYGIN: No, it’s actually something in between. We believe that this object was created out of the same material that created Uranus and Neptune. So predominantly, it’s ice and rock. But probably about 10%, at most 20% of its mass is comprised of hydrogen and helium, in sort of this extensive atmospheric envelope. MIKE BROWN: And we say that just because that’s actually a description, also, of Uranus and Neptune. So really what we’re saying is, we think it’s like Uranus and Neptune. IRA FLATOW: What does it do to fulfill all those requirements we have now to be called a planet? MIKE BROWN: So there is the official lawyerly definition from the International Astronomical Union, which I hate the definition, but I love the concept that it’s trying to describe. I just think it’s a clunky statement of the concept. The concept it’s trying to describe is that basically, planets are the things that are the gravitationally dominant objects in their region of a planetary system. And anything that you’re going to find by its gravitational influence is almost by definition part of that criterion. But really, if you actually went for the official lawyerly definition, it fits well within that too. It’s round, certainly it goes around the sun, and the one that everybody has problems with is “clears its orbit.” There’s now a mathematical description by an astronomer at UCLA, Jean-Luc Margo, which I think does a beautiful job of very precisely describing what that means. And this fits well within that criterion. IRA FLATOW: How do you know that something didn’t happen a long time ago that threw all these objects into these orbits, a collision or something, but there’s nothing there now? KONSTANTIN BATYGIN: So that’s an excellent question. And in fact, one of the first experiments we did was to take the data, take the observed orbits and leave them alone for a little while. If you come back in 500 million years, this alignment is gone. So we can’t outsource all of the interesting physics here to some event that happened during the infancy of our solar system. Something is keeping the orbits grouped right now. 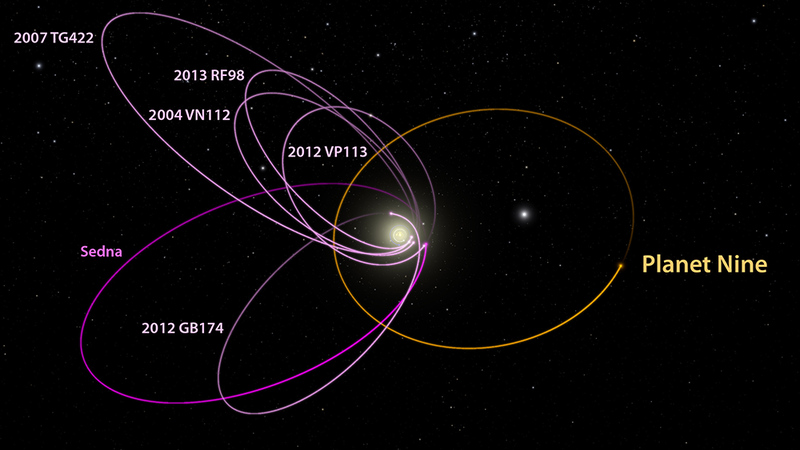 On geologically short time scales, these orbits would become randomized if not for the gravitational pull of Planet Nine. IRA FLATOW: So basically you’re saying you see the debris and how it’s all arranged in space, you say there must be a planet big enough to make them go into that arrangement, but we don’t see it and we don’t know where it is. MIKE BROWN: We don’t not know– I mean, we don’t know where it is. OK, sure. We don’t know where it is. Maybe that’s the right way to say it. But what we do know is we know its orbit. And what that means practically is that we know its path across the sky. So rather than have to look around the whole sky, which is a big place to look, we can actually look on a fairly narrow path of sky until we track it down. And in fact, we’ve even ruled out large portions of that track of sky already with some surveys that we’ve done. Our best guess is that Planet Nine is in the November sky. If you look up straight overhead at midnight on Thanksgiving Day, you’re probably looking more or less in the direction of Planet Nine. IRA FLATOW: And so what’s the over-under on getting a picture of the planet? Somebody actually seeing it and photographing it. KONSTANTIN BATYGIN: Well, we’re sort of in the stage of the project where we are beginning our observational search. This is definitely something that Mike is leading. But this sort of requires the use of the largest telescopes in the world, particularly the Subaru telescope. We sort of predict that between two to eight years as a reasonable time frame for detection. MIKE BROWN: But there is a website which predicts these things, and it gives us odds. Do you know what the odds are? KONSTANTIN BATYGIN: Yeah, so there’s a website called [? Metaculous ?] which gives us two to one odds that the planet will be discovered by the end of 2016. MIKE BROWN: I might have to bet against that. IRA FLATOW: Well, OK, taking it to Vegas. 844-724-8255. Let’s go to the phones to John in a very busy place this week, Iowa City, Iowa. Hi, John. John, are you there? JOHN: I’m totally excited about this. I’m a complete layman, but I thought it would be interesting, an interesting way to look for the planet rather than optically, and I know that it’s very dim and hard to see optically, would be to look for celestial objects behind it that are dimming as the planet passes in front of it. MIKE BROWN: So that’s actually a great way that people have been finding, for example, planets around other stars these days. The bad news is that the probability of going in front of a star is minusculey small, and so we would have to get extremely lucky to do it. There are some interesting ideas, though, about using the background stars to look for gravitational deflections of the light as the light goes by Planet Nine, which I actually think is an intriguing idea that might have some possibility. IRA FLATOW: Interesting idea. A tweet comes in, says could this ninth planet, David O’Leary says, be and dwarf star or a body of dark matter? KONSTANTIN BATYGIN: So that’s an intriguing question. I think the short answer is no. A dwarf star, we would have seen it. The WISE survey, which completed just about a couple years ago, would have detected a dwarf star. In fact, that survey has ruled out the existence of dwarf stars in the solar system out to something like 20,000 astronomical units, maybe further out. Dark matter is very, very, very diffuse. Even the most clumpy parts of dark matter, which are hypothesized to exist, called caustics, are sort of the size of the solar system, and they usually amount to about an earth mass. So it’s unlikely that this planet is anything other then just a planet made up of regular matter. IRA FLATOW: What made you guys decide to look for it? I mean, just say we’re going to go look for a planet? MIKE BROWN: It all started out– I think for me, it started 20 years ago. When I started looking at the outer solar system, it was with the idea of finding a planet. And that was the survey that led to the discovery of all the objects that led to the demotion of Pluto. I like to say but Pluto was collateral damage on the way to trying to find this planet. But after the demotion of Pluto, I was pretty convinced there were no planets left to be found. And in fact, as my wife will tell you, I was moping around the house, depressed about the lack of planets in the outer solar system. And then two years ago, there was a beautiful paper by some of our colleagues Chad Trujillo and Scott Sheppard, who pointed out that there were some strange anomalies going on, gravitational anomalies in the outer solar system, that really couldn’t be explained. They suggested maybe there was a planet, but their suggestion– nobody could make a planet do the sorts of things that they were hoping it would do. So people mostly moved on and didn’t think very much about it. But I know these guys, and I know that they knew what they were talking about. So we looked into it more carefully, mostly to prove it couldn’t be a planet, because that’s crazy. Everybody knows there are no planets out there. And this led to our two years of trying to convince ourselves it really wasn’t planet, and then realizing, yeah, it really is a planet. IRA FLATOW: What’s been the reaction of your colleagues? Skeptical? KONSTANTIN BATYGIN: So you know interestingly, mostly the reaction has been very positive, especially from our colleagues that have read the paper. They’re more or less compelled by the arguments. There’s been also a bit of skepticism which we are very happy with. I think ideas like this should be met with a healthy dose of skepticism. And hopefully this skepticism will lead some of our colleagues to confirm our calculations, and arrive at the same answer. Ultimately what we are hoping here is that this theoretical prediction of the orbit will trigger a hunt, an observational hunt for Planet Nine. That’s the goal of this paper. IRA FLATOW: I’m Ira Flatow. This is Science Friday from PRI, Public Radio International, talking about this unseen planet, Planet Nine. So you have to hope that somebody will give you some scope time to go look for it, or somebody will decide? MIKE BROWN: The way astronomy works worldwide is you write a proposal for time on a telescope, committee reads it, gives you the time. I think we have a compelling proposal to right, so I’m confident that we’ll be out at the telescope soon. IRA FLATOW: You’ve put out what you call a treasure map, breaking down where and what people should be looking for. Is this something that conceivably someone with a backyard telescope might see? MIKE BROWN: You know, it’s funny. Actually if it were at its closest approach to the sun at only 20 billion miles, it actually could be seen with the very largest backyard telescopes. Not just your one that you got at the store for Christmas. But people with serious backyard observatories could see it. But because it would be so bright, I think we’ve ruled out that part of the sky. So we’re pretty convinced it’s at its most distant part of its orbit. And at its most distant, it really is going to require the biggest telescopes on the Earth. IRA FLATOW: And what name would you like? That’s the first thing. I know we talk about planets all the time, and we get more– I’m looking at the boards on my telephone here. Vulcan, Sagan, and what kind of name could we give Planet Nine. KONSTANTIN BATYGIN: So our working name for the time being, aside from Planet Nine, is George. That’s a perfectly good name. I actually did this exercise earlier this morning where I looked at, statistically, the kind of average interval between the emails that I get asking to name the planet Bowie. I must be getting coerced, because that’s starting to sound like a really good idea. But realistically, this is the kind of question we should be left until this Planet Nine is caught on camera. IRA FLATOW: And when you think– you said perhaps one of you thinks it’s by the end of the year we might get a picture of it. Not so sure. MIKE BROWN: That would make us– we would have to be pretty lucky. If we get it by the end of year, it’s probably because it actually is already in somebody’s data, that they’ve taken images, didn’t realize it was there. And now they see this and they go back and look. In fact, I have already heard from several different teams of astronomers who are frantically going through their old data right now. And also, who knows, we could hear about it tomorrow. That seems unlikely, but maybe by the end of the year. I have been saying that I think it will be found within five years. That seems like a reasonable outside time period. There are places in the sky that it could be that would make it harder than others, particularly if it’s sitting right in front of the Milky Way galaxy. The Milky Way galaxy is big and bright, and kind of makes it hard to see things. But if it’s not there, it’ll be found very easily. If it’s there, it’ll take us a little more effort. MIKE BROWN: We’d be happy to. IRA FLATOW: — find out what it is and we’ll help you name the planet if you have any– because our listeners have absolutely no problem coming up with names. I’m sure you’re flooded with some yourself. IRA FLATOW: Good for astronomy. Konstantin Batygin and Mike Brown, both in the Division of Geological Planetary Sciences at Caltech in Pasadena. Thank you, and good– happy hunting.